This issue rolled in late in August just before school was about to begin. I used to once know the technical reason why the publication dates were always a month or so ahead of the time when you actually found yourself holding the issue in your hands, but suffice to say this issue represented the last gasp of summer. So curling up with the comic and a glass of lemonade on a rainy summer afternoon was just what the doctor ordered to stave-off the horrifying specter of school lurking just over the horizon. 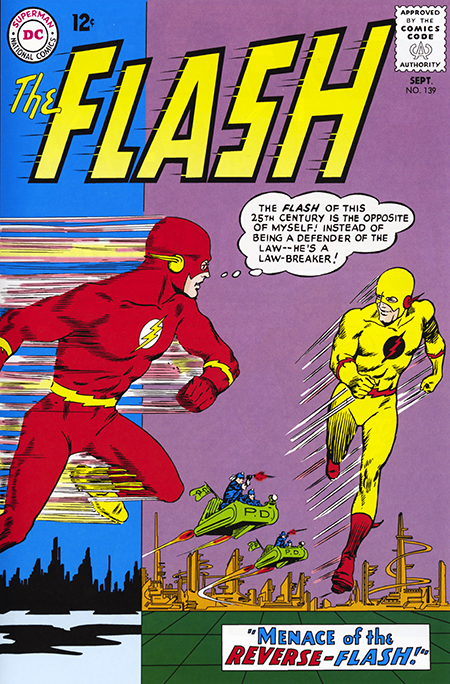 Reversing the Flash’s uniform colors to create a villain would seem at first to be a rather pedestrian idea, but writer John Broome was able to spin it into a book-length SF tale that elevated the work to a higher floor. Rather than burying it in the ground, a time capsule is sent into the future, probably to cut down on the long wait before it’s opened. Things look pretty rosy until its scientist creator realizes that the atomic clock contained within the capsule will turn into an atomic bomb when it arrives in the future (probably because they both contain the word “atomic”). However, it won’t turn into a bomb right away, so the Flash hops on his cosmic treadmill to go to the future and retrieve it before that happens. Meanwhile, “while Flash bends every nerve to attain the future and prevent a disaster”, the time capsule lands and is looted. The atomic clock/bomb disappears along with one of the Flash’s uniforms. Said uniform ends up in the hands of a crook known as the Professor who is able to amplify wave patterns in the uniform to give himself super speed. He then dyes the uniform to its reverse colors and, viola, we have Professor Zoom the Reverse Flash. The good Flash arrives in the future with nerves bent but otherwise ok to dispatch Professor Zoom and detonate the atomic bomb in the arctic. It would be hard to predict from his first appearance what the arc of Professor Zoom’s career would be, but, down the road, writers who were just kids when first reading this, would turn that somewhat silly name into something that would send the proverbial chills down the spine. Stay tuned, Kids. One final thought here, for anyone interested in reading the stories that have appeared in this blog to date, they’re all available in a beautiful new Omnibus Edition that recently came out from DC Comics. If I didn’t already own these tales in more than one iteration, I’d be pushing you out of the way at the comics shop to grab a copy. Still might.